VR and AR lets patrons explore new places. In terms of museum education, site visits are extremely helpful in fully understanding the history and context of a work of art. Since 2014, the British Museum has been working on the project called African Rock Art Image Project. A project team from the museum has collaborated with the Trust for African Rock Art to collect approximately 25,000 digital photographs of African rock art. Since the rock art is a part of the landscape, the project team is limited in where and how they can display this rock art. In order to provide a better learning environment, the British Museum has created an interactive tour using VR. 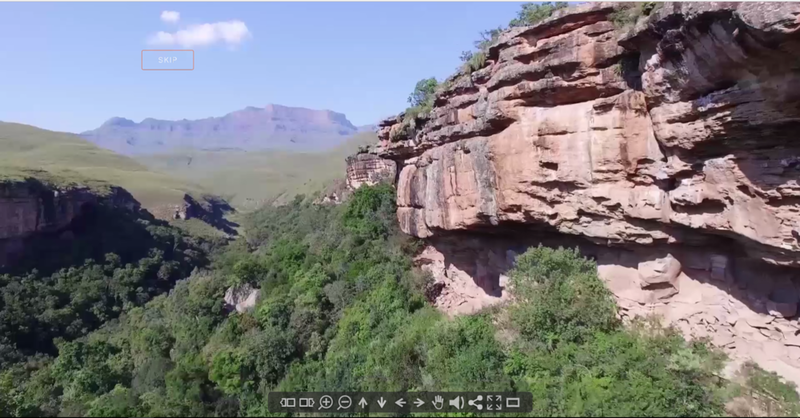 This program transports patrons to the rock art site in Africa without leaving the building. It also gives audio and subtitle descriptions of the artworks and locations. Thus, without spending tremendous time and expenses, audiences can explore African rock art in a deep and impactful way. One educational highlight of artificial reality is simulated time travel. Watching a chronological transition helps patrons make a connection between past, present, and future. MediaCombo and GuidiGo will present their first AR audio tour at the Morgan Library & Museum. This AR program allows audiences to see the portraits of the Morgan Library & Museum founder, Pierpont Morgan from his childhood to adulthood. The Natural History Museum of Los Angeles is taking this time travel idea to new levels by creating an experience that brings audiences to the Jurassic era. They collaborated with UK company, INDE, who has created very realistic 3-D animals in AR. 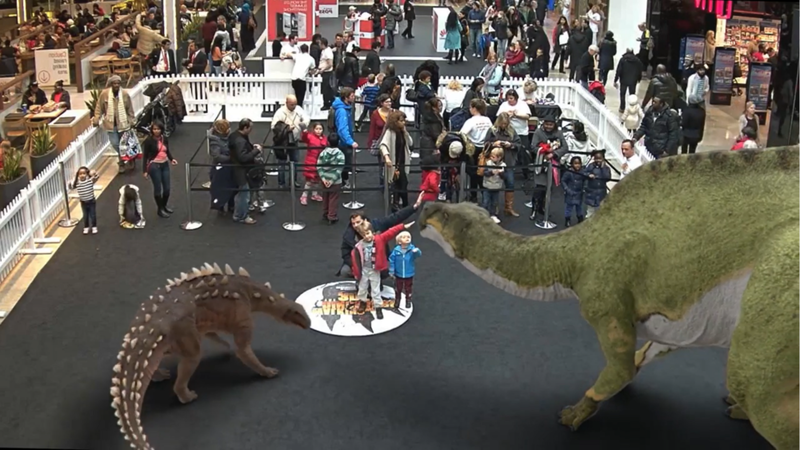 The project Back to the Jurassic allows audiences to experience life-size 3-D dinosaurs. Stepping into history, whether through works of art or scientific experiences, will enrich an individual’s experience with the museum. Through artificial reality, museums can not only improve their education programs, but also reduce potential damage to their collections. 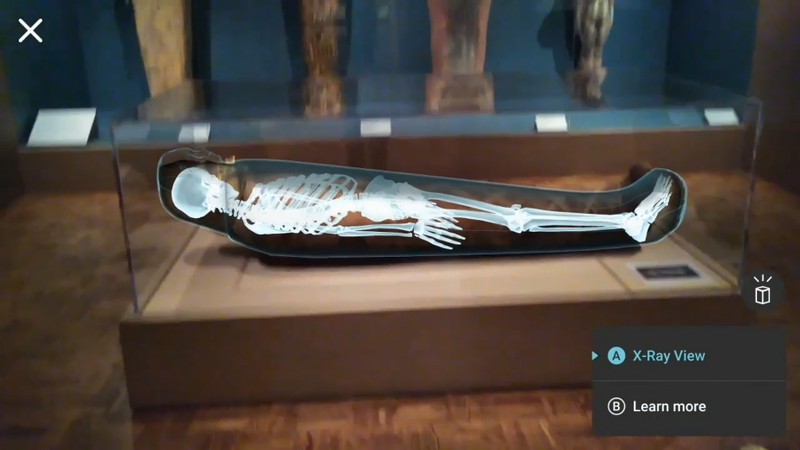 An AR tour at the Detroit Institute of Arts enables audiences to see the skeletons underneath the Egyptian Mummies’ sarcophagus. With this AR technology, the museum does not need to display an actual mummy to educate their audiences. Displaying the real mummy can raise controversial issues of privacy and morality. A writer Melissa Ford has raised ethical questions in reference to respecting the dead in this article. Is it respectful to put the dead in glass cases without their permission and allow visitors to gawk at them in the name of science? Hence, some audiences might not feel comfortable with seeing real mummies. However, with VR and AR, museums can preserve their collections more safely and with fewer ethical concerns. AR and VR will help museums to overcome above three challenges: distance, time, and preservation. In addition, visualizations of artificial reality can promote engaged learning and broaden the audiences’ perspective regarding the works that they are viewing. Even with these benefits, arts managers should not believe that VR and AR are panacea for improving their education programs. They should review the environmental conditions of the museums and the features of AR and VR to maximize the positive effects of these technologies. If you want to learn more about the process of developing augmented reality, please check out the research post Using Augmented Reality is Really Simple written by Annesha Ganguly. "Benefits of using augmented reality in education." OnlineCultus. December 24. Accessed November 20, 2017. https://www.onlinecultus.com/8-benefits-using-augmented-reality-education/. Dent, Steve. "Google Tango AR takes you inside a mummy's sarcophagus." engadget. January 10. Accessed November 19, 2017. https://www.engadget.com/2017/01/10/google-tango-ar-takes-you-inside-a-mummys-sarcophagus/. Forbes, Neil, and Antonella Fresa. "Museum education with digital technologies: participation and lifelong learning." Accessed November 18, 2017. https://ec.europa.eu/futurium/en/system/files/ged/rch_thinkpapers_06.pdf. Ford, Melissa. 2013. "Is It Okay to Put Mummies on Display?" Geekdad. November 26. Accessed November 18, 2017. https://geekdad.com/2013/11/okay-put-mummies-display/. Hicks, Paula. 2016. "The Pros And Cons Of Using Virtual Reality In The Classroom." eLearning Industry. December 29. Accessed November 18, 2017. https://elearningindustry.com/pros-cons-using-virtual-reality-in-the-classroom. Angeles.” Indestry. Accessed December 3, 2017. www.indestry.com/news/2016/10/5/dinosaur-augmented-reality-experience-in-museum-los-angeles. Ron, Chesky. 2017. "The Benefits of Augmented Reality in Education." TECHWALL. August 25. Accessed November 18, 2017. https://www.techwalls.com/benefits-augmented-reality-education/.